Villa can accommodate up to 8 people in 3 bedrooms with 3 bathrooms The villa is cleaned & prepared prior to arrival. Linen & Towels are provided. Baby Cot is available on request at no extra charge. Villa & pool cleaned regularly and garden well maintained too. 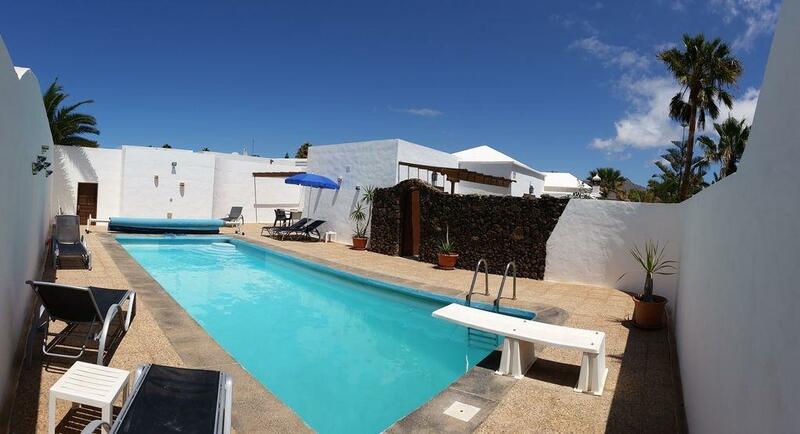 Amenities/Facilities: Barbecue, Pool Heating, Private secluded Pool, Garden, free WiFi, Room fans, Satellite TV, Safe, Dishwasher, Fridge/Freezer, Hob/Stove, Iron, Microwave, Oven, Washing Machine, car parking. Changeover days are flexible. Access to villa manager at all times. Town centre, beaches & restaurants are just 5 minutes walk. Smoking is not permitted inside the villa, thank you for your co-operation. There is also a communal pool and tennis courts on request for the key. There is also mini golf on Los Calamares. The pool area is completely secluded with sun loungers and a lockable door for security & safety for young children. Parking is available on the property in front of the garage and ample parking outside in front of the villa too.